After my three days in Aalborg, I was looking forward to going back to Copenhagen on Saturday 16 March. 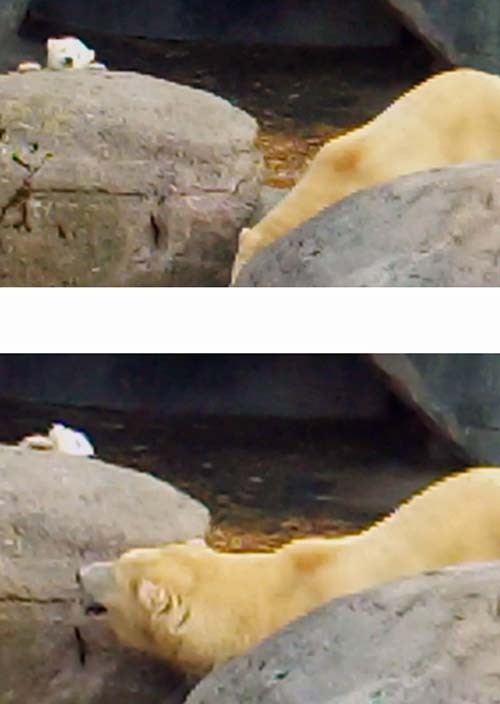 We now know that Lynn’s cub is a girl, but in this first feature about my Saturday visit, I think you will agree that I had a bit of a clue that she might be. 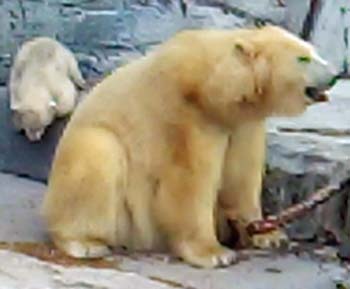 Whereas boy cubs tend to hide behind their mothers, the girls have an instinct to defend the family. 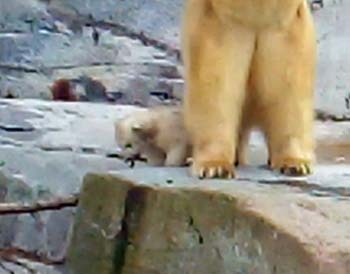 Faced with a large crowd of people watching her, Lynn’s cub showed both courage and curiosity. She popped up from behind a large rock. Her little black nose was taking in all the interesting smells. 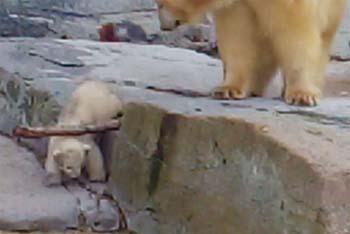 We know that a cub does not have especially good eyesight, so the crowd would have been quite scary. 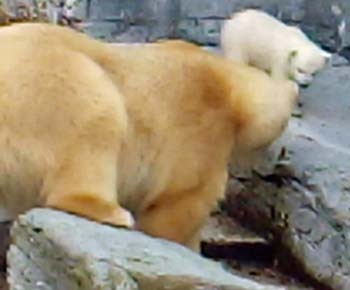 Lynn stood behind her as if to reassure her that there was no danger and the cub was able to sniff us all in safety. 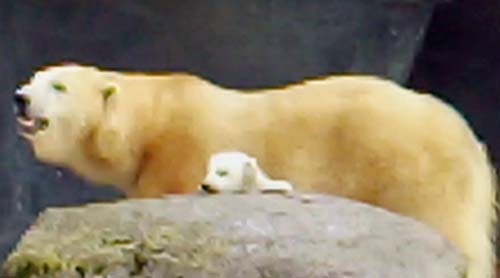 Lynn and the cub seemed to be chatting all the time by slight chuffing noises. 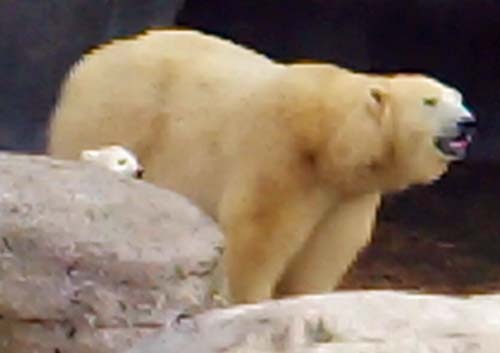 The cub was fascinated by the crowd and faced us bravely, with Lynn standing behind her. 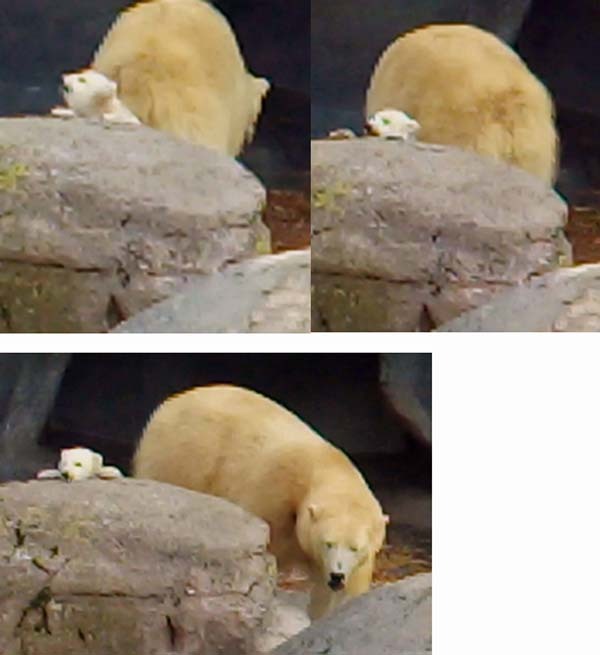 Like all Polar Bear Mums Lynn has a sense of timing when it comes to teaching the cub or letting her play. After a while, Lynn started to move, waiting for the little one to follow..
Baby was still so interested in all the moving, smelly shapes. 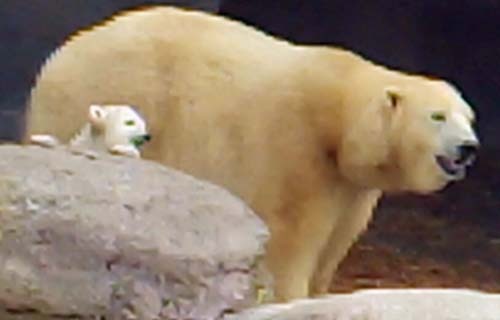 But Mum was on the move, so perhaps it was time to go. Lynn is already planning their next adventure. I also decided to take a break and felt like some strawberry ice cream, in a suitable container, which I was able to take home. 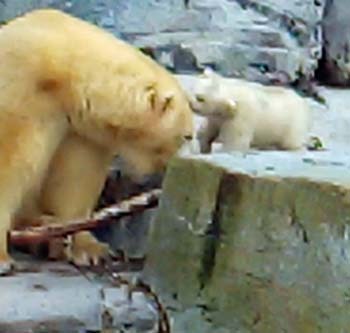 My last day in Denmark was proving quite eventful with Lynn and her cub. 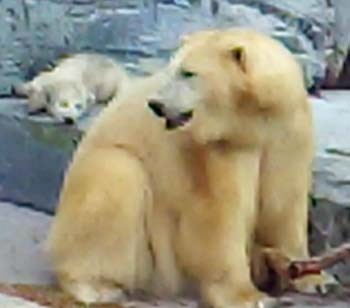 Lynn is an excellent Mum and spends time teaching the cub to learn skills. 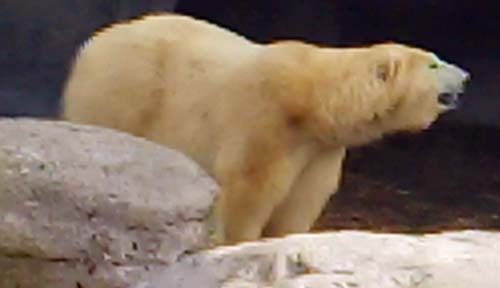 The cub soon finds something interesting to test with taste and smell. 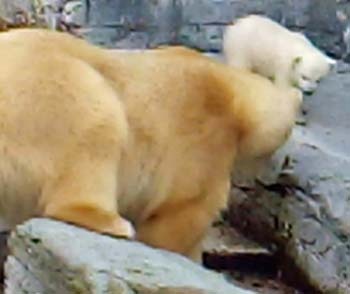 The cub finds something interesting to show Lynn. 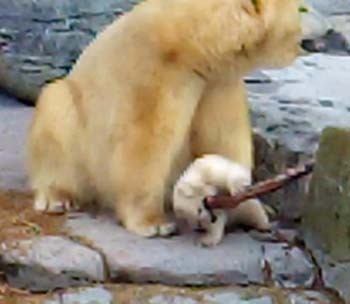 The cub pulls a branch out to show Lynn and let her check it. 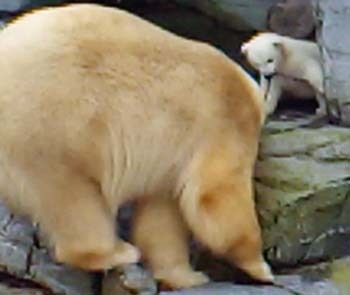 The cub then notices a bigger branch, and Lynn follows her. 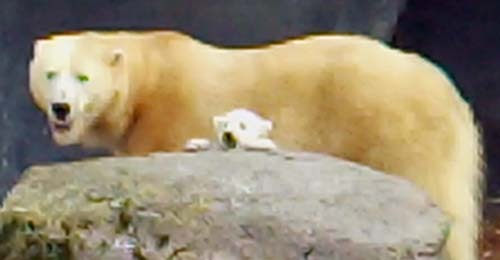 The cub pauses to rest. Lynn waits patiently for Baby to follow her. 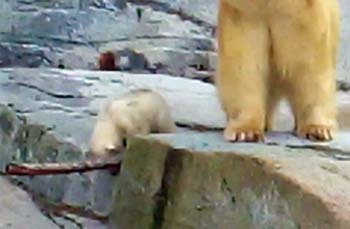 Baby has learnt the Polar Bear “both paws” press down. 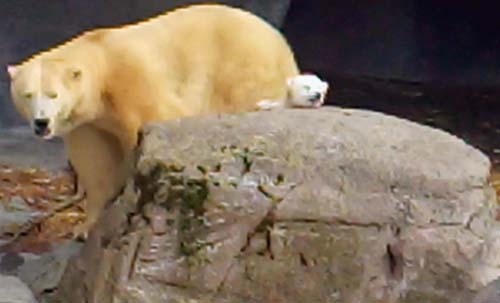 Lynn is very relaxed as Baby pushes down on the branch. 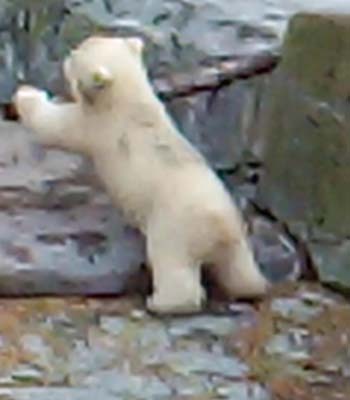 Like all Polar Bears, Baby examines things and tries to work out how to move them. 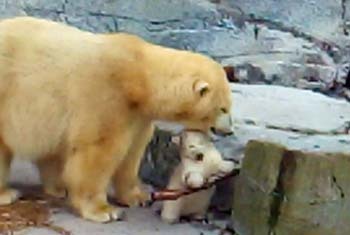 Lynn seems very pleased with Baby’s progress as she uses her paws to move the branch. 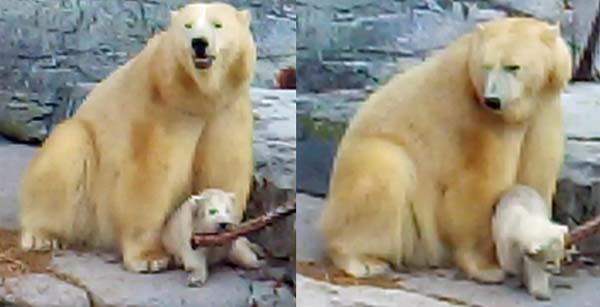 Baby is working hard to try and move the branch, while Lynn is so calm. 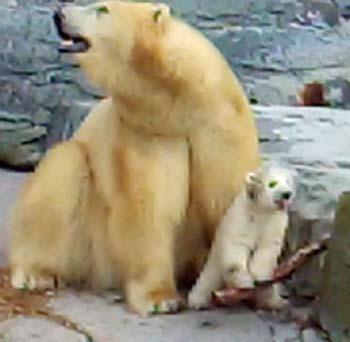 Despite Baby’s best efforts, the branch does not move, so Lynn gives her an encouraging nuzzle. Lynn seems to decide that “class” is over for the time being and Baby can move on. Baby is already following her nose to find something new to investigate. 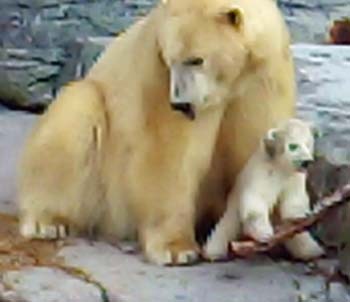 Baby realises that Lynn still wants to show her something else about the branch from another angle. 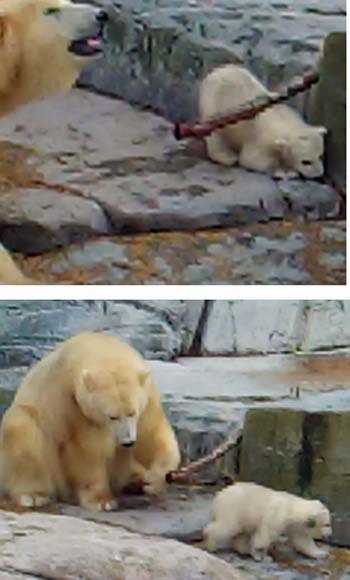 Baby tries to move the branch again from the top. 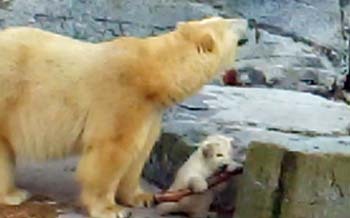 Lynn waits patiently while Baby carries on investigating the branch. Baby decides to go back down underneath it. 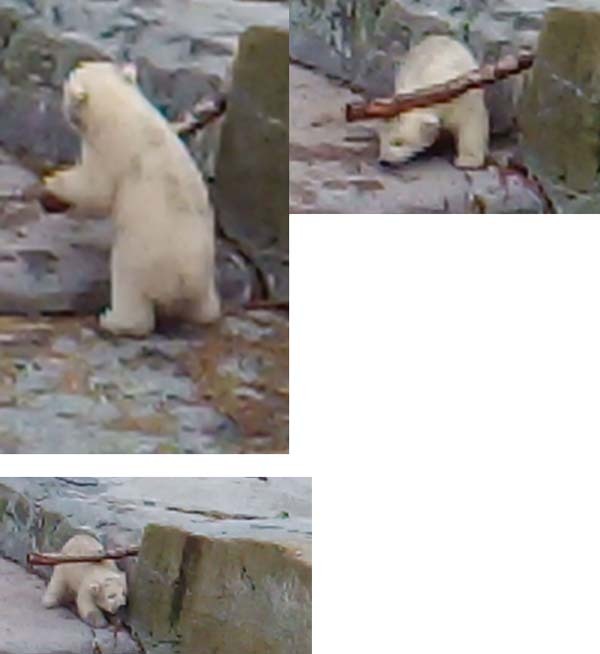 After looking at the branch with Lynn, Baby returns to it again and again. 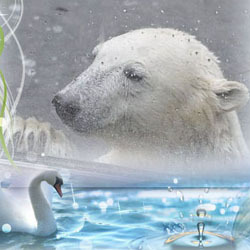 She is learning that patience, curiosity and persistence are crucial to being a Polar Bear! The ice cream container looks very nice! Lynn is an excellent mentor although she’s a mother for the first time. Thank you so much for this wonderful ‘cartoon’! Desr RALPH – That’s not only an interesting training our for baby but also for us readers/watchers. Patience, curiosity and persistence in the right extend is also not that bad for us humans and adults! Thank you for letting us participate in observing baby’s lesson and progress. Charming as usual! 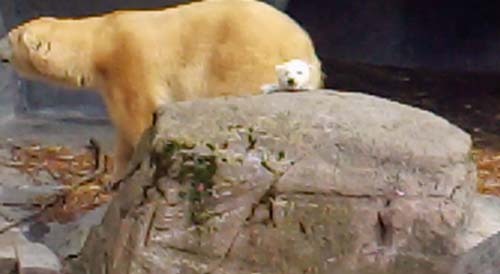 Lynn’s daughter is cute as all cubs are. She is very curious and playful. 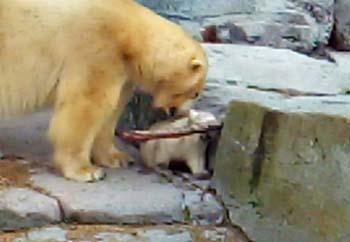 Lynn ist so eine tolle Mama und die Kleine Maus wird gut beschützt, so dass sie alles erkunden und ausprobieren kann. Danke für die wunderbaren Bilder. Thank you for another part of your Denmark report! The amount of pics illustrates how enthusiastic you are about Lynn and her little sweetheart. 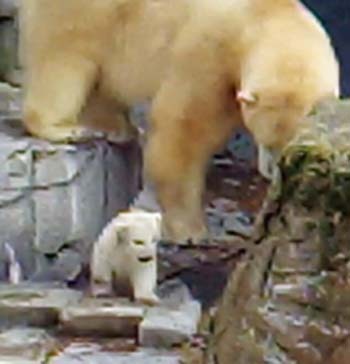 I wonder what name the cub will get. She is a lovely, curious and frisky bear girl and a brave climber. One can´t but take her into one´s heart. 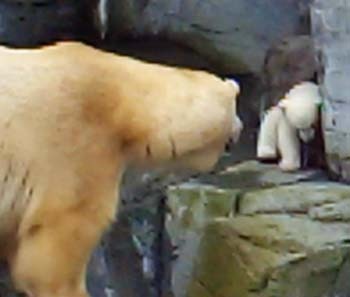 Lynn macht das ganz prima, ist ihr erstes Baby und sie passt auf und hat viel Geduld. 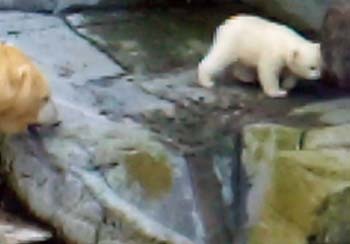 Die Kleine ist niedlich wie alle Eisbärbabys und wir werden noch viel Freude mit der Kleinen haben. Danke dir, für deinen schönen und interessanten Bericht. danke für die neuesten Bilder aus Copenhagen. Süß wie die Kleine über den großen Felsen guckt, aber auch mit dem großen Stock. 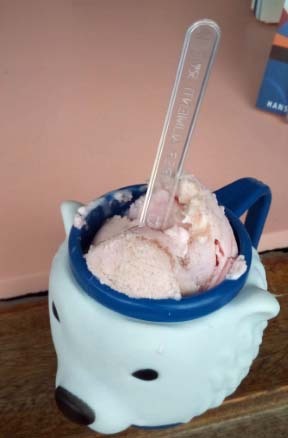 Das war mir klar, dass Du den Eisbecher mitgenommen hast. Log in | 56 queries. 0.863 seconds.